is like looking at your target through a microscope! Diverse man-made prisms - Allows total elimination of parallax! Multi-coated sandwich filtered lens - See and read mirage and eliminate target movement! We have been producing and improving our Optical Boosters ™ since WWII. Today we market more than two dozen lenses, along with over 20 different factory housings and three universal housings that will fit all full-size scopes. Whether you're young or old, we have a BulzEyePro ® booster for you. These Optical Boosters ™ will greatly enhance any scope and improve your ability to hit the bulls-eye. 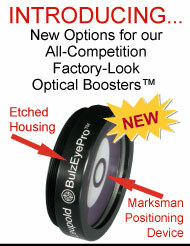 Our optics boosters are more effective and less expensive than an internal boost job and do not affect scope warranty. Our lenses and housings address and correct every known optical illusion experienced by scoped firearm shooters while improving safety, and increasing size and clarity of targeted image. As we age, our shooting ability should not decline due to diminished eyesight (called presbyopia). Our company is dedicated to restoring sight loss while increasing size and clarity of picture for all shooters, and to improving firearm optics and their safety. Hunters will enjoy quick, huge, clear, precise sight images with improved safety. Competitive shooters can add an enhanced ability to read mirage and adjust to zero parallax. Diabetics will also see all of this, along with a vast improvement in consistency and repeatability of shot. Our Guarantee: You get all of our latest technology and will be 110% satisfied or your money back. If you are shooting against a BulzEyePro Optical Booster™, and you do not have one, you have a "tough row to hoe"! KNOW YOUR TARGET, aim and shoot well, and above all else, stay safe. Made from U.S.A. materials. and assembled and packaged in the US. Want to increase your ability to "hit the bulzeye"? Get the genuine BulzEyePro® Optical Booster™ experienced shooters around the world are raving about! The Optical Boosters worked a treat... I just won the UK Rimfire Nationals (50-Metre LV Gold, Unlimited 50-Metre Gold and Aggregate Cup) and got a gold in the air rifle class, too. I don't have to wear glasses or contacts anymore and the crosshairs are nice and crisp again. I am a 73-year-old 1,000-yard BR shooter... I liked the view so much that I am going to buy a few more. When shooting at 600 to 1000 yards you have no other option but to use a BulzEyePro® booster. YOU CAN'T HIT WHAT YOU CAN'T SEE. Great product. Read more BulzEyePro® Optical Booster™ customer reviews and testimonials ».